Hanes Men's Big & Tall Briefs are sure to become an everyday necessity. These underwear has elastic waistband and a preshrunk cotton construction. 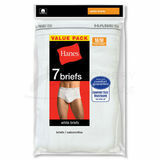 Hanes Men's Big & Tall Briefs are made with quality cotton fabrics so that you get a great fit and a great feel. The cut and design of these briefs eliminates ride up so he is comfortable all day long. Hanes Men's Big & Tall Briefs has a full-cut design for a comfortable,lasting fit. The comfort-weaved waistband keeps its shape wash after wash, and long lasting double-stitched seams give you confidence. Don't leave home without Hanes.